The Frederique Constant is a luxury Swiss watchmaker, and if there is anything they are good at, it is making exquisite looking watches with wow designs. The Frederique Constant Horological Smartwatch is the latest hybrid smartwatch from the Swiss brand and includes a model for women which is the first time in this smartwatch series. Like its predecessor, it is still a WorldTimer smartwatch which allows you to check other time zones by just pressing the crown. The hybrid smartwatch is compatible with both Android and iOS smartwatch. The men models cost about $1,150, but that is the essence of a luxurious design by a renowned Swiss watchmaker. This smartwatch is one hell of beauty like the ones before it, starting from the 42mm rose gold stainless steel watch case to the elegant leather band with beautiful yellow stitches this is a luxury timepiece in every way. The hybrid smartwatch has no secondary dial like other WorldTimer models before it and does not have that bulkiness which results in a more light and comfortable smartwatch that can be worn around the clock. There is also a hidden icon in the watch face to show if it is in activity or sleep tracking mode which is the only indication that it is a smartwatch. The crown at the side act as a button that is used to switch from one tracking mode to another and to access the WorldTimer mode to check other time zones. 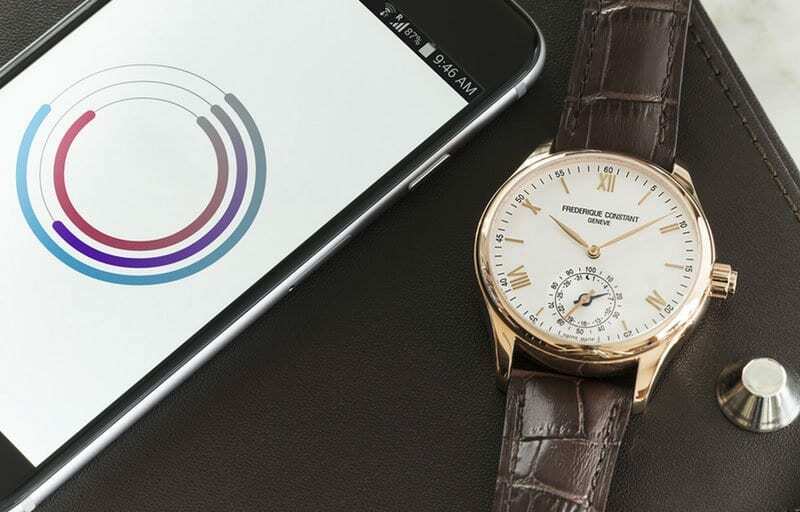 The Frederique Constant Horological Is more of a fitness tracking hybrid watch than a smartwatch because it does not show or receive notifications. It has an accelerometer which is used to count steps, estimate distance covered and calorie burn. It also has sleep tracking feature which is not automatic, and you would have to switch to sleep tracking mode to do this. There is an inactivity alert that gives off a vibration from the watch which is kind of soft and there is no way of adjusting vibrating intensity. There is also a smart alarm feature which has a more intense vibration. To get things up and running you will need the MT-365 smartphone app downloaded to your Android or iOS smartphone and note MootionX which uses an identical icon which is the same layout but will not pair with the smartwatch. At the home screen, it displays data in three rings which represents sleep, coach, and activity which is similar to the layout used in the apple watch. To sync the app you would have to press the crown which will activate the hands and should illuminate the two or three ring which depends on whether you have slept or not. Additional features are included which includes a stopwatch and a BMR calories which stands for basal metabolic rate. This is a number of calories you burn at rest and is displayed alongside age, gender, height, and weight. The battery lasts for about four years rather than the two years you get with the previous models. Which means you do not have to worry about charging anytime soon.